Ninety-nine bird carcasses nailed to a ten-by-four feet plywood board by obscure Danish artist John Olsen. The adjacent room houses an exhibit of fetishism (nudism, infantilism, shamanism) in design but retains its infamy as the site of Marco Evaristti’s 2000 exhibit Helena (known colloquially as “the fish-in-blenders exhibit”) and an onlooker’s decision to liquidize a goldfish. Like its rival museums near Copenhagen and Aarhus, Trapholt built its reputation as one of Denmark’s finest contemporary art museums through its flirtation with scandal and contempt. 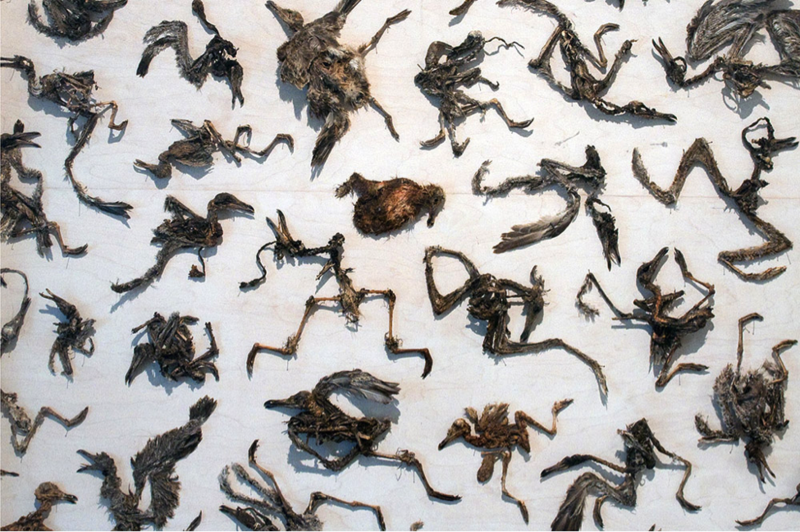 But while its rivals all enjoy metropolitan audiences who would accept Olsen’s dead birds as art, Trapholt sits on the outskirts of Kolding, my hometown, with just under 70,000 inhabitants. Koldingers have a two-dimensional take on art: if it has a frame, we call it “art,” and it the colors within that frame form a discernable motive, we call it “good art.” To us, cubism still seems like the products of artists who lacked the precision of skilled artists. If we knew what it meant, we might call ourselves a city of Stuckists. Conceptual artists must think of Kolding and its environs as a small-scale version of the Bermuda Triangle. Outside it lie several thriving museums that house radical conceptual arts exhibits; within it, only Trapholt has managed to stay afloat financially, a feat it could never have accomplished without the government’s generous endowment for the arts. Given our disdain for what people from the capital call “conceptual art”, it makes sense that Koldingers have long preferred the city’s other museum: Koldinghus. Housed in a medieval castle complete with moats, watchtowers, and cannon-holed walls, Koldinghus displays the kind of art Koldingers want to see. Its permanent collection of Golden Age paintings, ceramics, and silverware has the immediacy we look for in art. We saw the three-hundred-year-old still life of a corn field in our high school textbooks on the Danish art canon, so we accept it as the ideal form of art. The velvet ropes that cordon off the exhibit housing Koldinghus’ most prized assets, viewable only by appointment and only by art historians, convinces us all the more that we are not just seeing artworks, but the very essence of Danish history. Trapholt has no velvet ropes. They call it a museum policy, but Koldingers think the lack of security correlates to a lack of security-worthy art. Consider the comments of an elderly man whom I overheard asking a Trapholt receptionist “do you even have any paintings that are older than me?” when I visited this summer. His consternation when the receptionist replied that they do not have any conventional paintings at all shows the Kolding frame of mind – a frame which I shared until I left for high school. 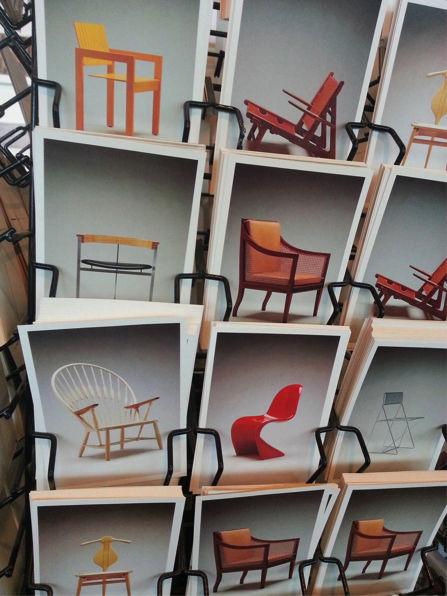 Selection of chair postcards in Trapholt’s gift shop. (Photo: Hansen Ong). Koldingers’ two-dimensional conception of art must wane with distance, because when we leave the Triangle of Death, it seems we learn to appreciate conceptual art. On our trips to Copenhagen and abroad, my family would visit museums we would never have gone near if we had stayed within the Kolding area. 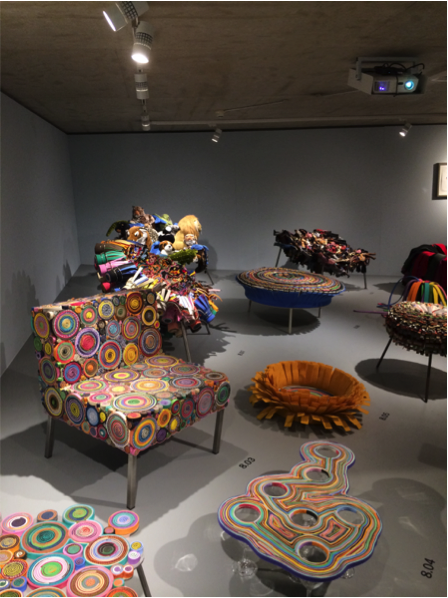 On our 2003 trip to London, we went to the Design Museum, the Tate Modern, and even the Museum of Contemporary Art! Of course, we still frowned at Olafur Eliasson’s The Weather Project and questioned whether a big lamp really constitutes art (one does not go from philistine to all-accepting art lover overnight), but we had shown a willingness to experience, and perhaps even appreciate, non-framed art. As a family, we made glacial progress toward acceptance of contemporary art in the decade that followed the London epiphany, but when I left home for a Dutch boarding school in my junior year of high school, my progress gathered pace. Outside the tri-city area, I met people who not only tolerated non-framed art, but who appreciated it and even produced it. I took part in my first flash mob, dabbled with three-dimensional visual art, and spent my holidays traveling to museums which housed what my fellow Koldingers might deem “radical art.” At the same time, I suffered the signature malaise of the expat, homesickness, and the combination of my growing interest in radical art and my longing for the city that scorns such art produced in me a change I had not foreseen. When I went home for fall break after just three months outside the Triangle of Death, I visited Trapholt of my own volition for the first time. That visit opened my eyes more than any visit to a foreign museum could have done, because I discovered far from the elitist retreat I had imagined it as, Trapholt welcomed believers in non-framed art from all walks of life. I did not find a coterie of the petty-bourgeois but a mixture of secretaries, farmers, shop owners, and even my high school art teacher. The greatest shock of my visit came not from the heterogeneity of the audience, but from the diversity of media Trapholt had on display. Sure, Trapholt houses its fair share of disfigured, abstract sculptures, but interspersed between these uninterpretable forms I encountered ornate works of contemporary ceramic art, a photographic chronicle of The Rolling Stones by two noted Danish photographers, and a special exhibit featuring upcoming Danish fashion designers. When I came back the following summer, that same exhibit housed Nick Cave’s sound suits, the first exhibit in Trapholt’s history to feature velvet ropes on the artist’s insistence. But to my surprise, I did not find the exhibit that would become my favorite in Trapholt’s main building; instead, I found it on the lawn, in an old summer home designed entirely by Danish architect and designer Arne Jacobsen. While the cottage seems bland at first sight, every single object in the home is nothing less than a work of art. Jacobsen designed everything, from the six mobile cubes that comprise the summer home to the silverware and the cupboards that hold it, and each item has entered the history of Danish design as well as a majority of Denmark’s households. To this day, his Seven Chair from 1958 epitomizes Danish design in its simplicity and is featured around most of the nation’s kitchen tables (or, rather, the IKEA knock-off at a tenth of the price of Jacobsen’s original does). I absorbed the tour guide’s anecdotes to such an extent that I inhabited and took pride in them. One such anecdote about Jacobsen’s Ant Chair has since become the story I use to justify why I take pride in Danish chairs. When Jacobsen released the three-legged chair in 1952, it resonated across Europe’s design scene for the way it rethought the very concept of a chair. What designers everywhere did not anticipate, however, was the wobbly nature of the chair and the ensuing injuries chair aficionados sustained from falling off the chair. Embroiled in grievance lawsuits, Jacobsen insisted that the Ant Chair remain in production and summarily fired anyone who dared to suggest producing a four-legged variant. Not until safety inspectors at Novo Nordisk declared the three hundred three-legged Ant Chairs in their canteen unsafe and threatened to back out of a million-kroner deal did Jacobsen agree to produce a four-legged mutant chair. He retained his artist’s pride, though; to this day, Jacobsen’s manufacturer delivers four-legged Ant Chairs with an explicit proscription against displaying them in galleries or commercial showrooms. The pride Jacobsen took in his original product echoes the prides Danes take in their design heritage and in their chairs. 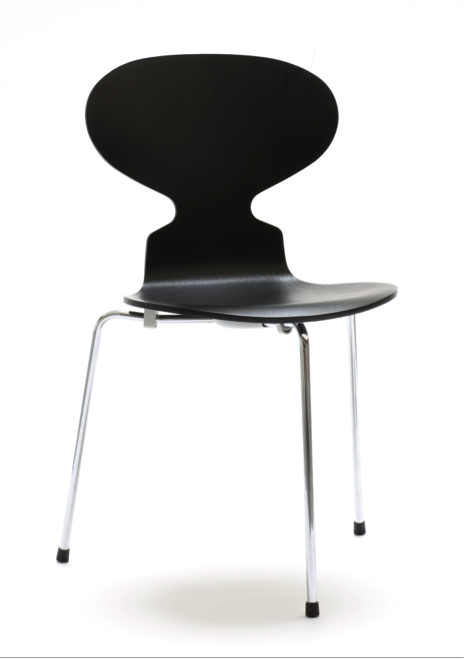 I come from a chair-crazed culture, where vintage Jacobsens often sell for over $100,000 and where museum gift shops sell scale replicas of Arne Jacobsen’s Egg Chair, Swan Chair, Seven Chair, and (three-legged) Ant Chair. We might not recognize it from within, once we leave home, we realize that even in the country’s most philistine region, oases of art and chair fetishism remain.